PMAX3 narrow-depth axial fan is engineered for applications with restricted space that require high static pressure. Multi-Wing introduces PMAX3™, its latest precision airflow fan. PMAX3 narrow-depth axial fan is engineered for applications with restricted space that require high static pressure. Featuring a new blade root design, PMAX3 is Multi-Wing’s strongest profile. This narrow-depth fan has a minimum axial deflection and is ideal for many stationary applications and off-road equipment. They include radiators and oil coolers, generators, mobile compressors, small- to medium-size tractors, rollers, compact wheel loaders, excavators and other off-road equipment. Offered in diameters from 17.5 to 25 inches (445 to 635 mm), PMAX3 fans have an axial depth of 3 to 4.5 inches (77 to 114 mm). These modular fans are available with 3-, 6- or 9-blade configurations and have pitch angles from 20° to 47.5° in 2.5° increments. Blades are constructed of glass-reinforced polyamide (PAG), which has an operating temperature from -40° to 240°F (-40° to 115°C). The hub is constructed of pressure-die-cast aluminum alloy. A 15.75 inch (400 mm) diameter PMAX3 has tip speeds of up to 426.51 feet per second (130 meters per second). 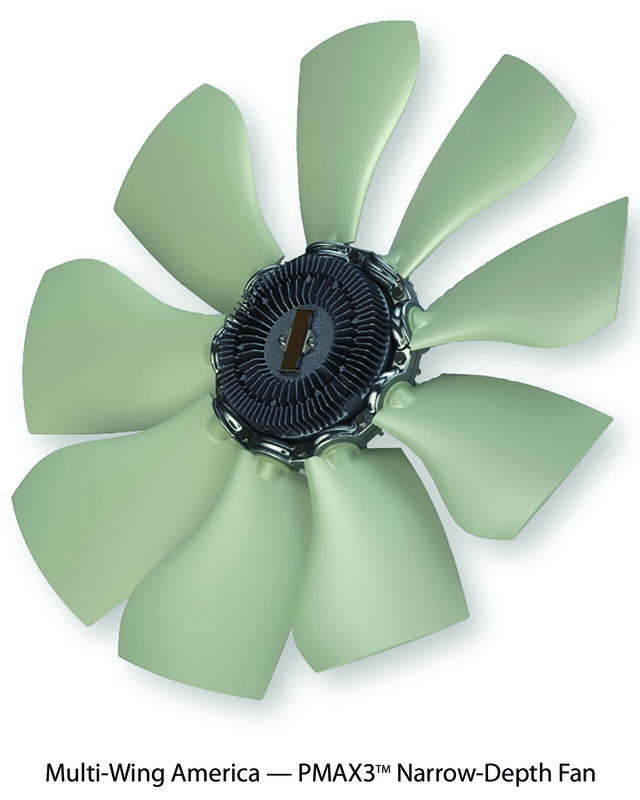 The maximum-diameter PMAX3 fan is capable of operating at 3800 rpm. This narrow-depth, high-static pressure fan is compatible with MAHLE T13, T35 and competitive fan clutches. To discuss your specific application with one of our engineering support specialists or to learn about PMAX3 narrow-depth, high-pressure fan, visit http://www.multi-wing.net, call +1 440.834.9400 or email info(at)multi-wing(dot)net. For access to our updated Optimiser fan selection application, visit http://www.multi-wing.net/access. Founded in 1972 as The Crowley Company, Multi-Wing America is North America’s leading supplier of high-performance axial flow fans. As an ISO 9001:2008, 14001:2004 certified company, Multi-Wing delivers exceptional service, prototyping and modular fans in the broadest range of materials and blade profiles. Headquartered in Burton, Ohio, the company specializes in providing small- to large-volume customized fans for HVACR, industrial heat exchangers and engine cooling markets.